Operation Wigwam consisted of a single nuclear detonation, (both the operation and test are known as Wigwam), conducted 400-500 miles SW of San Diego, California(about 29 Deg N, 126 Deg W). 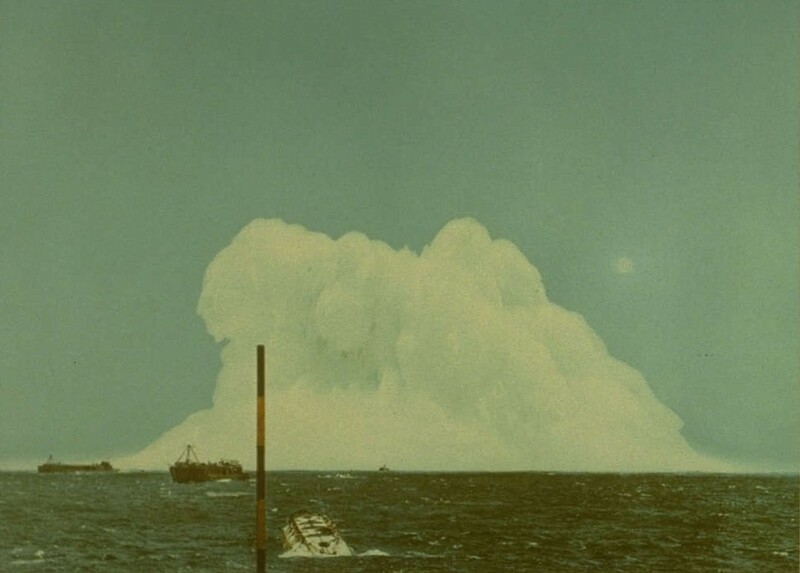 It was a deep water test (the ocean is 16,000 feet deep at that point) to investigate the vulnerability of submarines to deep nuclear weapons, and the feasibility of using depth bombs in combat (there was considerable concern about problems with surface contamination). The test device was a B-7 (Mk-90) Betty depth bomb that was suspended by a 2000 ft cable from a barge. The dry weight of the bomb was 8250 lb, 5700 lb when submerged. 6800 personnel on 30 ships participated in Wigwam. A 6 mile tow-line connected the fleet tug, Tawasa and the shot barge. Suspended from this line at varying ditances from the barge were three "Squaws" - sub-scale submarine-like pressure hulls equipped with instruments and cameras. The ships conducting the test were 5 miles upwind from the barge, with the exception of the USS George Eastman (YAG-39) and USS Granville S. Hall (YAG-40). These two ships were equipped with heavy shielding and were stationed 5 miles downwind. 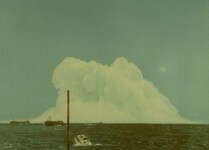 Both ships were contaminated by the base surge, but due to the relatively dilute radioactivity (since the shot was at such a great depth) and the heavy shielding kept exposures within the Operation Wigwam dose limit of 3.9 rems. Nearly all personnel were issued film badges to measure radiation exposure, and some 10,000 badges were processed. Only 3 personnel were measured as having doses exceeding 0.5 rems. One-point safety test of an all-oralloy prototype sealed pit weapon that was similar to the Plumbbob Priscilla and Redwing Lacrosse devices (tested at 37 and 40 kt respectively), probably the primary for the TX-15/39 and W-27. To ensure safety of the deployed design, two changes were made to enhance the nuclear output of this test. More oralloy was used than would be present in the war-reserve model. Also 3 external neutron sources ("zippers") were used to ensure a large neutron population at the moment of criticality. The 37.1 inch diameter device weighed 600 lb. One-point safety test of the plutonium containing W-25 sealed pit weapon. The device was 17.4 inches in diameter, 26.6 inches long, and weighed 218 lb. 3 zippers were used as neutron sources. This was a one-point safety test for the prototype TX/W-28 primary. 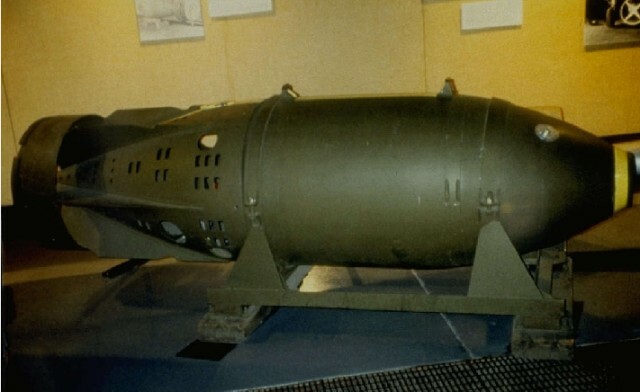 The 16.8 inch diameter nuclear system weighed 143 lb, the total device weighed 275 lb. 3 zippers were used as neutron sources. Like shot No. 3 this was a one-point safety test for the prototype TX/W-28 primary. The device was basically identical except that 6 zippers were used as neutron sources. The enhanced yield (compared to No. 3) was probably due to the larger neutron population injected into the core. Due to the low rate of neutron multiplication possible in this slightly supercritical system, only a limited amount of neutron multiplication is possible while the core remains compressed. A larger initial neutron population results in a larger final neutron population (and thus total fission output).